Shock, horror! No Copics were used in the production of this project! We are travelling back in time for todays Countdown teaser.......to the era of Vikings! This is the new Birdie Brown stamp, handsome chap, isn't he! 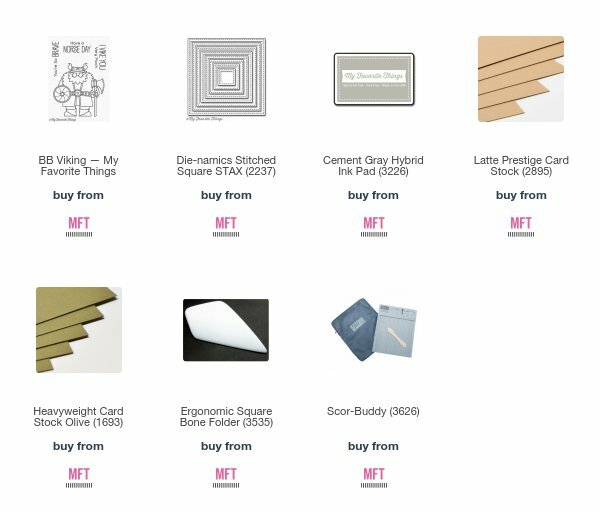 Once coloured, the Viking was cut with a die from the Stitched Square Stax, mounted on to a square of MFT Latte cardstock. This was then mounted on to a square card base made from MFT Olive card. You still have a couple of days to wait until the new release and I will be back soon with another project. Don't forget you can also see my work on my Facebook Page and Instagram. Wow! You totally out did yourself on the Viking. Your card is spectacular! Your coloring is again, stunning ! Awesome stamp and fabulous colouring!!! You bring the images to life with your colouring!! I really liked this stamp .... until I saw your colouring when I realised that nothing I do with this stamp will do it anywhere near the justice compared to what you've made with your creation. It's stunning. Your talent is wasted. 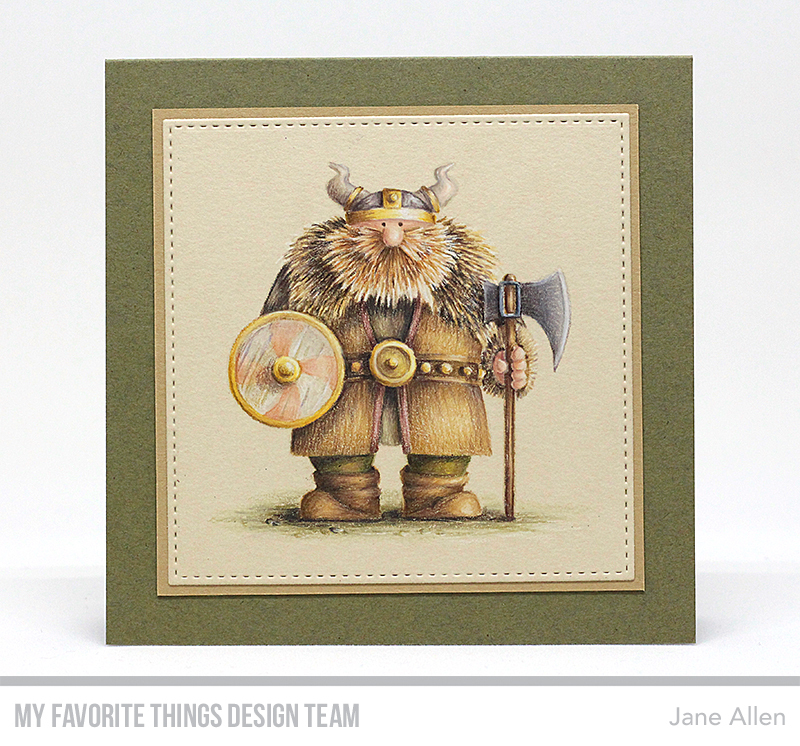 Great and original new set from BB - you've really brought this Viking back to life with your wonderful colouring! Such great details. Awesome new stamp and die sets! WOWZERS, I love your coloring! I'm totally blown away by that amazing beard!!! This is so gorgeous! I love the coloring and was looking forward to seeing the full card. He is so amazing!!!! I was totally gobsmacked when I saw him on the MFT blog. I love him!!! Love how you colored this Viking. I love the colors. I love the Viking! Your coloring is, as always, brilliant! Hi Jane. Loving how you're using some of the new MFT 2018 release. Your colouring of the Viking is spectacular - so much detail. Must check to see if you've made a video of this one as I'd really love to watch you colour, as you're brilliant at it. Love all the other cards too. Thank you so much for sharing. I just ordered this stamp on line this morning, your colouring is spectacular, I saw this on pintrest. Thank you all for your lovely comments. As to videos, I don’t do them - because of the detail that I put in to the work, my pieces often take several days to complete. Educational videos work best for simple, short projects.........numb bums and snoring would ensue if you watched a video of me colouring from start to finish. There is no real secret, just hard work and years of practice!